On Monday 9 March, during a four-hour marathon session, the Commission supérieure des monuments historiques validated, with extensive reservations, the restoration project for the Hôtel Lambert. According to our sources, Michel Clément, director of Patrimoine, fulfilled his role by resisting whatever was unacceptable, notably the installation of bathrooms on top of the Galerie d’Hercule, something which we had overlooked and which had been widely criticized, and justifiably so, these last few days. He also stated that the left wing would have to remain under the strict control of the Monuments historiques. Although the original décor on this part of the building has disappeared, the volumes of the period remain and the current project is not specific enough as to their treatment. As we had implied in our news item of 22/2/09, the matter is moving along favorably even if we still need to remain cautious as to the final outcome. The parking lot under the garden has been abandoned, and will go finally under the courtyard which is not ideal either but is a lesser evil according to most. Technical installations will be placed under the garden and occupy less space than what was originally planned. The trees will be preserved although some wanted to have them done away with under the mistaken pretext that there were no trees in the 17th century. The concrete chests built in the basement for the technical installations will not be water-proof to avoid any risk of flooding . The elevator will no longer go through the beamed ceiling. Thus the Lassus staircase will be preserved, as will the neo-Gothic stained-glass windows. The flame ornaments  designed by the chief architect will be changed so as to be more discreet. The initiative launched by the Commission du Vieux Paris and picked up by the press has thus been highly beneficial. The final decision is in the hands of the Minister of Culture who will probably approve the Commission’s recommendations. Nevertheless, it is too bad that it took such a controversy to arrive at the final result . Unfortunately, many less important buildings are mutilated since they do not arouse the same interest among the general public. A water-proof chest would rise up under the water pressure in case of flooding, thus threatening the Hôtel’s stability. [It might also be wise to conceal a bit more the satellite dish on the roofs, perfectly visible in our photograph. We will continue to follow the project, as suggested to us by the owner’s lawyer. Previous article in Heritage : Is France going to get rid of the Hôtel de la Marine ? 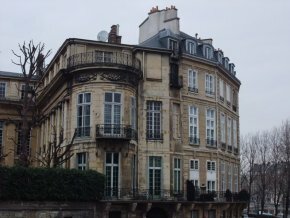 Next article in Heritage : Hôtel de la Marine : will France go to the highest bidder ?